The Kobelco KNW Series assembly is designed and constructed to exacting quality standards. These standards as applied to each KNW package provide long operating life, minimum maintenance, and low operating costs. The two-stage rotary screw compressor provides completely oil-free air because no oil is allowed in the compression chambers. This “State of Art” Air Compressor Package has a patented Super Rotor profile, which is the most efficient in the industry. This asymmetric rotor profile, provides the lowest power consumption per cubic foot of compressed air. The Kobelco KNW Oil-Free Series rotary screw air compressor package is designed, manufactured, assembled, and tested in the United States. This packaged system is delivered complete and ready for immediate operation. 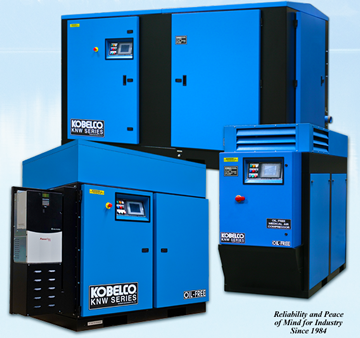 Air Power Services is an Authorized Distributor for the Kobelco KNW Oil-Free air compressor packages and is factory trained. Our factory trained technicians shall provide competent service, timely repairs, and reduce production downtime. 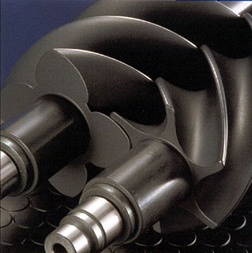 Our patented Super Rotor profile is the most efficient in the industry. The machined forged steel rotor sets have the most precise tolerances in the industry. FDA approved rotor coating further increases volumetric efficiency. In addition, the new profile provides 20% more displacement per revolution thus lowering rotor speeds and increasing bearing life.